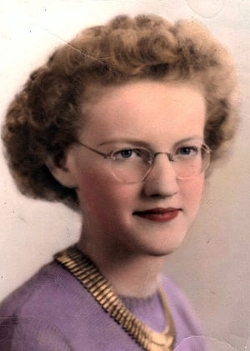 Leona "Jeannie" Ahrendsen, 87, of Olin passed away on December 7,2014 at her home. Her Funeral Service was Wednesday, December 10, 2014 at Lahey Funeral home in Olin, Iowa. Family and friends called on Wednesday from 9:00 to 11:00 a.m. at Lahey Funeral Home in Olin. Burial was held at Olin Cemetery. Leona Jean was born on July 2, 1927 in Anamosa, Iowa to Edward and Esther (Vanderburg) Engelbart. On December 14, 1945 she was united in marriage to Merlin Ahrendsen at Wayne Zion Lutheran Church in Monticello, Iowa. He passed away in 2010. Jeannie was a housewife and homemaker. She was a member of the Olin Community United Methodist Church and the Eastern Star in Oxford Junction. She served on the election board for many years. In her younger years she was in many card clubs. Jeannie loved to bake, garden, play cards, and read. She lived for her family and loved spending time with her children, grandchildren, great-grandchildren, and great-great-grandchildren. She is survived by four children; Linda (Charles) Abel of Coralville, Brad Ahrendsen of Olin, Brian (Sara) Ahrendsen of North Liberty, Jill (Greg) Eganhouse of Olin, ten grandchildren, ten great-grandchildren, two great-great grandchildren and a brother Everett Engelbart of Anamosa. She is preceded in death by her parents, her husband, five sisters and one brother.